Local search algorithms these days are a finicky bunch, so why not just give them what they want? Okay, so you’re a small business owner and you’re overwhelmed and thoroughly confused by even basic online marketing. I get it, Local SEO itself can be dizzying. Even the pro’s in the SEO community struggle to keep up with Google’s numerous shifts, and occasional fumbles, in this space. Not to mention, being on your own, means going up against bigger and more prominent local brands, capable of leveraging consumer affinity to quickly amass things like reviews, +1’s, like’s, and check-ins on a more reliable basis. But that doesn't mean the local space is without unique opportunities for you, with your limited marketing budget, to compete and ultimately outrank your larger counterparts. Google has stated in the past that 20% of all PC-based search is related to local. And if you couple that with the surge in mobile, where 50% of searches have local intent, you already have two compelling reasons why a Local SEO strategy is a must. But if you’re like many business owners, you're either befuddled on where to start, still pissed at Google for suspending your listing, or savvy enough to at least know how convoluted and fast evolving the local space actually is. In any of these cases, you might benefit from a little SALSA for your Local SEO efforts. Google's 2010 blog post on how local search ranking works stated that they use three primary signals for rank determination: Relevance, Prominence and Distance. How each of these signals are defined and measured will continue to be a topic of much discussion with each successive update in local, social, and mobile. Saturation: Quantity and quality of your citations and depth of content. Accuracy: Reliability and consistency in your NAP and business information. Longevity: Historic performance of your local assets. Age of page, and more. Social: What are you and the local community telling search engines about your business? Activity: Freshness factor. How often is information being updated? Below is the long-winded breakdown of what you need to know. Focus on building valuable citations throughout the web. Citations are basically mentions of your business from a quality source along with another piece of supporting business information, such as your phone number, address, and website. Citations come in two forms: structured and unstructured. Google's local algorithm relies on multiple sources for information verification, weighing various trustworthy signals to determine which businesses are most relevant for any given local search query. Creating citations is way of establishing your online ‘certificate of trust’ -- comparable to link building methods. While listings on some sites could be beneficial for most businesses, your particular business type and location heavily influences which citation sources will have the most impact. The best citation building approach is to go through the verification and optimization process by hand. You will find plenty of business directories offering free listings with unique options to enhance your content. Consider paying for enhanced listings on high-authority sites like Angie’s List, BBB, Citysearch, Superpages, Yelp, YP, etc. Upgrading to a paid listing is sometimes the only way to add extra categories, photos, a business description, etc. Data suppliers like Neustar Localeze, Acxiom, and InfoGroup provide opportunities to feed your business data out to hundreds of Yellow Pages publishers, mobile and social search platforms, and navigation services. Be prepared to wait up to several months for your information to percolate through the local ecosystem. Seeding your business information at the primary data aggregators should be done in conjunction with manual submissions, not as a replacement. Reserve your tender loving care for your Google+ Local listing. David Mihm wrote a good step-by-step blog on the Google+ Local claiming process. I'll spare you the re-hash. If you get lost, you can always fall back on Google's troubleshooter. And if all else fails, just pick up the phone and call Google. Yep, Big G now offers phone support. Yahoo! Local and Bing (also Nokia Prime Place) also require PIN verification. If you want to dominate the SERPs for keywords relevant to your customers' purchasing behavior, you need to do A, B, C + X, Y, and Z to get there. Easy enough, right? Use Maps to research which of your competitors are ranking well, especially those furthest out from your city centroid. Google their phone number and identify well-indexed business listing opportunities that you may have missed. You can use tools like Whitespark's local citation finder to expand your search. Look for high-quality niche citations that no one else has. Target directories relevant to your vertical (i.e., 123Movers, Autotrader, Healthgrades, ServiceMagic, etc. ), review sites, and popular local-only sites that Google might think are important. Links with local scent (especially .edu, .org, or local blogs) hold extra authority. Here are a few sneaky citations and five easy, hyper local citation sources. SEO Tip: GeoTag your photos. Geotagging is the process of adding GPS locational data to your images. By associating the pictures with your business, sites can use this attribute as another signal of legitimacy for your listing. You can add these GPS tags manually via sites like Panoramio (my favorite), Flickr, Mappr and Google Earth. Our team recommends adding a minimum of 10 photos to your Google+ Local listing. Also be sure to add keyword descriptive file names and provide image descriptions wherever possible. For a more detailed overview of the process, here is a guide to geocoding images for Local SEO. You should have at least one image larger than 250 x 250 but less than 1024 x 1024 and under 1MB. This square image should be your logo or a picture of your place of business. Additionally, on the photos topic: Instead of using a generic name like "IMG00034.jpg", modify the file name to something that describes the product or service related to the picture like "roofing-repair-oakbrook.jpg" or include the business name along with the location. Use different keyword combinations. If there is an opportunity to provide an image description and/or tags, include important keywords but don’t make it spammy. Onsite SEO is also a big part of Local SEO. I should probably dedicate more than a few sentences to this, but this post by Chris Silver Smith provides one of the best summaries on homepage improvements for local search rankings that I know of, so I might as well outsource the topic. One thing of importance I’ll note, be sure your site is using schema format to display your business information, here is a solid article on how to do it. Make sure to verify your structured data with the Google Rich Snippet Testing Tool. SEO Tip: Create a KML (Keyhole Markup Language) file with your location data. All of our member listings are available in KML format, and these references even displayed on Google Places pages at one point. You can do this with GeoRSS feeds as well. GeoSitemapGenerator is a free and user-friendly KML file generator I'd recommend. Consistency of a business's NAP (Name, Address, and Phone Number) is critically important. Listen to what Google Guidelines say, and don't attempt to game the system by trying things like "optimizing your business name" by inserting keywords and city names into this field. Publish only a single local phone number. Avoid call tracking numbers, this will send mixed signals to Google. Sorry, there's no way around this. Fix your bad listings. These could be duplicate listings or just incorrect business information floating around on various directories. Ensure you only have one canonical listing on Google Map Maker. It's a wiki mapping interface so any user can suggest edits to your information. You can pay data aggregators and content distribution services to update their databases, but this alone will not take care of problematic listings. Local directories that utilize this data might only integrate the new information into their indexes a couple of times a year.Think of it as a game of “Whack-A-Mole” which necessitates claiming and fixing listings by hand. A tedious process for sure. Check often, and be sure to whack those dupes. Good SEO will always focus on longevity. Some of Google's most recent local updates have cracked down big time on listings with questionable content aimed at quick hit results. Fake address and mailboxes have been popular for some businesses to use, but carry the ultimate risk -- being banned/blacklisted by Google. Know that Google's local algo will only continue to get smarter and smarter. Moral of the story: focus on longevity. We all still want to be able to net some early results, but it’s important to set realistic goals and expectations. Meaningful results in local don’t happen overnight, or the next night, or the following night. Some data updates alone could take in excess of 180 days. 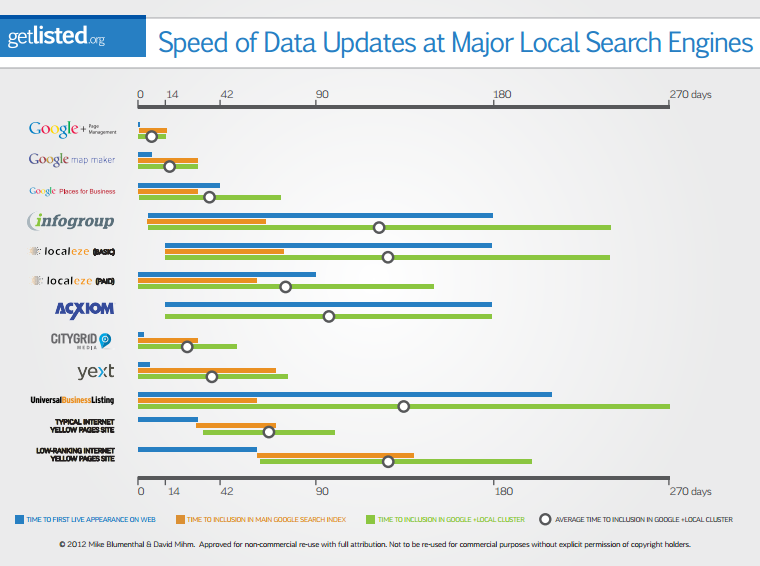 GetListed published a useful chart illustrating the Speed of Data Updates at major Local Search Engines. Longevity can also be measured. It makes sense that some of the same factors Google uses to measure your website are also employed on your local listing (i.e., historical performance, click-through rate, bounces, etc.). As far as longevity goes, Google weighs in factors like the age of your Google+ Local page, and the timespan between updates and activity across the local spectrum. The longer your business’s information stays accurate, the better. If you're a business with a good history and happy customers, you'll have a bigger advantage over spammers and others trying to game the system than you might have had in the past. Many businesses already have hard-to-replicate local links to their site, and as the search engines increasingly use social and relationship data for rankings, you will continue to benefit by focusing on longevity. With "prominence" being one of Google's primary signals for ranking, we know a great deal of effort goes into measuring a business's "relative popularity." Things similar to PageRank and the quantity and quality of citations (as discussed earlier) factor into this category, but in my opinion it’s social signals (the ones that are verifiable) that will be increasingly informative to Google's search algorithm. Social signals (think of them as citations) can already have a pretty big impact on your local rankings and overall success on Google. Last year I suggested that Local SEO in 2013 would be increasingly about leveraging social citations. In January, Facebook made a big commitment in this direction with social search, and Google’s local algo should only continue to become more sophisticated, in this regard. More mobile and social search options will only further drive measurable engagement. Customer reviews (a ton has been written on this, so I’ll be brief). With the merging of Google Places and Google+, native Google+ Local reviews have become increasingly important as a ranking factor. Being that reviewers must now have an established Google+ account, reviews can be taken a little more seriously (for the most part). Under Google’s new review system (the 30-point Zagat scale), 10 reviews seems to be the magic number where you might expect to get a boost - as long as the sentiment leans positive. Even though quantity trumps quality (some bad reviews are okay), there also seems to be a diminishing value in the quantity of reviews beyond 10 for most business types. Reviewer authority matters. Google Top Reviewers, for instance, have the most authority (similar to Yelp Elite status). Their "PlaceRank" patent hints at similar types of signals, like "StatureWithinCommunity". Be mindful of how quickly you generate reviews (the "velocity" signal). This is just another way Google authenticates reviews, so don't get them all at once. Don't just focus on Google reviews; ask customers to review you elsewhere, too. Target third-party reviews sites that are popular for your business type. Be wary of reputation management services that promise to generate reviews for your business. Google will take them down. Remember: Google wants to know what the local community is saying about your business so you should make it easy as possible for your customers to engage socially. But consider that not all business types are affected equally by reviews. If you’re an auto mechanic, for example, then yeah reviews matter, but if it’s not common in your industry for people to read and write reviews, than probably not so much. Ratings and reviews are only part of the picture. When it comes to social signals and your ranking, there’s a whole slew of measurable social actions beyond just ratings and reviews. Those are just the most visible. Google looks at all different signals, and from a variety of sources, like the quantity of +1’s and shares (as well as who and where they are coming from), check-ins, Facebook like's, Twitter followers and mentions. As Google+ comes more into the fray (wait, they're #2 already), it's not hard to predict the importance of social to search and local, and I’m referring to real social activity from real people. In an interview just this week, Eric Schmidt, the former CEO of Google, confirmed they will be giving higher rankings to content tied to verified profiles. Google's director of Maps for mobile also hinted at “interesting things” related to new personalization features expected to roll out in the coming months. Sounds to me like they’re taking the logical next steps of integration for Google+ Local. We’ll have to see what’s in store. My blanket recommendation is to spend a couple of hours a week on social media and be active on multiple channels. Diversify your social assets, just don’t expect profitable gains from your activity. Well, not directly at least. Search engines more than ever emphasize content freshness in ranking. However, results of a new survey of small businesses found that nearly half (49%) say they've never updated their listings online. Ouch. This would help explain all the ‘bad’ listings out there, but what this also means is that most listings are likely missing the enhanced content that both search engines and consumers look for and rely on. Traditional SEO demands that you keep your website content fresh. Google has further added new signals that include a "recency" factor into search relevance. Local SEO isn't much different. The merge of Places and Google+ demonstrates the importance of fresh content for local marketing. The formerly static Places pages are now hubs for content interactivity. Update content like messages "from the owner"
Your Local SEO SALSA is best served fresh, don’t let your listings get stale! Of course in local search marketing these efforts extend beyond your Google+ Local page to your various social profiles and other local listing assets. Even if you have no new information to submit, simply logging in to an account and clicking save could send a fresh signal to search engines. Trends in local, social and mobile all point to the rising importance of employing a Google+ Local strategy. It’s hard, we know. But the answers are out there.